Malaysia faced Japan tonight in the Thomas Cup final at Siri Fort Stadium in New Delhi, India. Thomas Cup 2014 Final Results : Japan won the Thomas Cup final 2014 when Japan’s third singles Takuma Ueda won the third match against Malaysian Liew Daren 17-21. Heartiest congratulations to Japan for winning the #ThomasCup2014. I must say that all Japan players showed amazing fighting spirit! 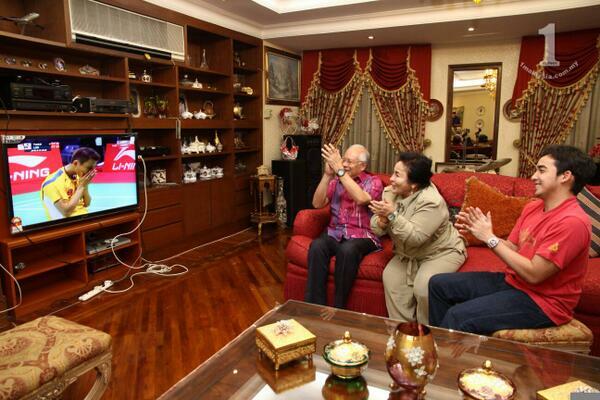 @NajibRazak Twitter : Prime Minister Datuk Seri Najib Razak joined millions of Malaysians in cheering the country’s shuttlers playing in the Thomas Cup finals in New Delhi, India. Despite losing the #ThomasCup2014, credit must be given to all Malaysian players (Lee Chong Wei, Hooi Thien How, Tan Boon Heong, Chong Wei Feng, Goh V Shem, Tan Wee Kiong and Liew Daren) as they have fought hard and tried their best! Thank you all for your effort to bring Malaysia to the finals! Malaysians got its first win when World no. 1 Dato Lee Chong Wei defeated World no. 4 Kenichi Tago 21-12, 21-16. Japan’s Kento Momota beats singles Chong Wei Feng 21-15, 21-17 with his powerful smash. Japan’s third singles Takuma Ueda led the first match 21-12 but Liew Daren brought back hope by winning the second match 21-18. Japan was crowned the 2014 Thomas Cup champions when Ueda won the final match 21-17.